Traveling in the Philippines is an extraordinary experience that will give you access to some of the most stunning beaches, coral reefs, and landscapes the world has to offer. 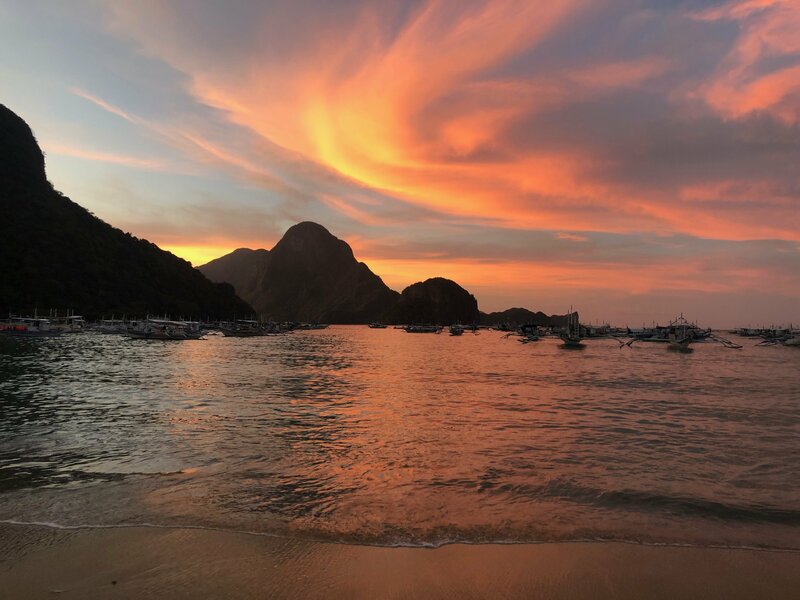 It’s a really unique country, both physically and culturally, and there’s a lot of things tourists should know before they go to be able to experience it fully. 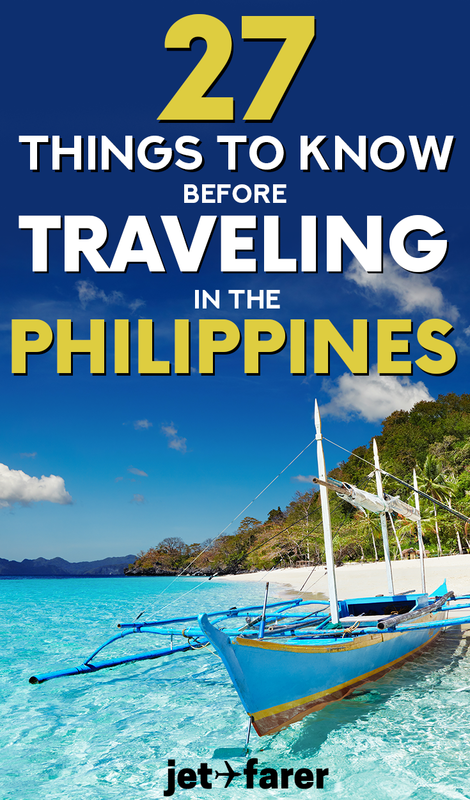 As someone who has traveled to the Philippines 7 times (yes, you read that right), I’ve compiled this list of Philippines travel tips to help you prepare! The beautiful country of the Philippines is different than most other places in the world because it is a true melting pot. Over a very tumultuous history, many different countries left their mark on the traditions and identity of the Philippines. Additionally, a variety of natural disasters, from earthquakes to volcanic eruptions to typhoons, have shaped the land in otherworldly ways. 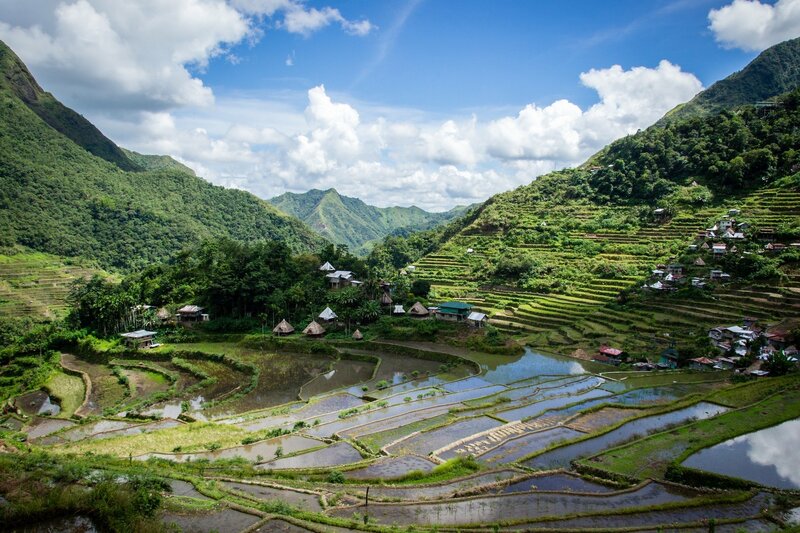 Read on to learn about all of the essential things to know before traveling in the Philippines. 1. The Philippines has over 7,000 islands. Many people think that the Philippines is a “small” country. While that may be true in terms of landmass or general appearance on a world map, there are actually over 7,000 islands in this vast country. I’ve seen estimates that say the Philippines has between 7,100 and 7,700 islands total. To put that in perspective, if you traveled to one island a day, it would take you over 19 YEARS to visit them all! It also means that even though you’ve seen one island, you really haven’t seen them all. This means that train travel doesn’t really exist here, and in order to get from island to island, you generally need to fly or take a boat. More on the logistics of this later. 2. The Philippines has been colonized for hundreds of years throughout its history. Changing hands is something the Philippines is familiar with. In its history, the Philippines was colonized or occupied by Spain, the United States, and Japan, finally gaining its independence in 1898. Spain was the country that colonized the Philippines for the longest amount of time – over 300 years. Throughout this time, Filipinos were forced to take on the language and customs of Spain, resulting in Spanish words infusing the local languages, Catholicism as the main religion, and Hispanic names and traditions among families here. The answer? It’s complicated, and it draws on a whole painful history that’s tough to explain in the 2 minutes I’ll actually have their attention span. 3. Many Filipinos work overseas to support their families. The Philippines sends workers all over the world, called Overseas Filipino Workers (OFWs), who send money back via cash remittances. This accounts for a whopping 10% of the country’s GDP. It also means that many families have at least one person abroad sending money home to help support them in the Philippines. This is important to note because you’ll likely run into foreign workers from the Philippines all over the world, no matter where you travel! 4. The capital city, Manila, is one of the top 10 largest cities in the world by population. Again, there seems to be a misunderstanding that the Philippines is a “small” country. But in reality, there are LOTS of Filipinos, and the metropolitan areas are actually quite large. There are so many people that the capital city, Manila, is consistently ranked in the top 10 largest cities in the world by population, with over 12.8 million residents (as of 2015). Traffic in Filipino cities can be fairly horrendous, so it’s best to plan travel to and from the airport several hours in advance to account for the congestion. 5. Many places in the Philippines are under the threat of overtourism. Although many parts of the Philippines is still open and welcome to tourism dollars, some of the most popular tourist destinations are straining from the impact of unsustainable tourism practices. As an example, Boracay, one of the most famous resort areas in the country, was recently closed to tourists for several months so officials could clean up the beaches and nature areas. Other tourist hotspots, like El Nido in Palawan, face similar threats to infrastructure and sanitation. With that said, try and get out of the cities and the major tourist areas and visit smaller islands while you’re in the Philippines. Go beyond the “top 10” list and try to find smaller islands. Not only will you help curb overtourism, but you’ll also get to experience a more magical, authentic side of the Philippines that’s quickly disappearing from the more popular islands. 6. 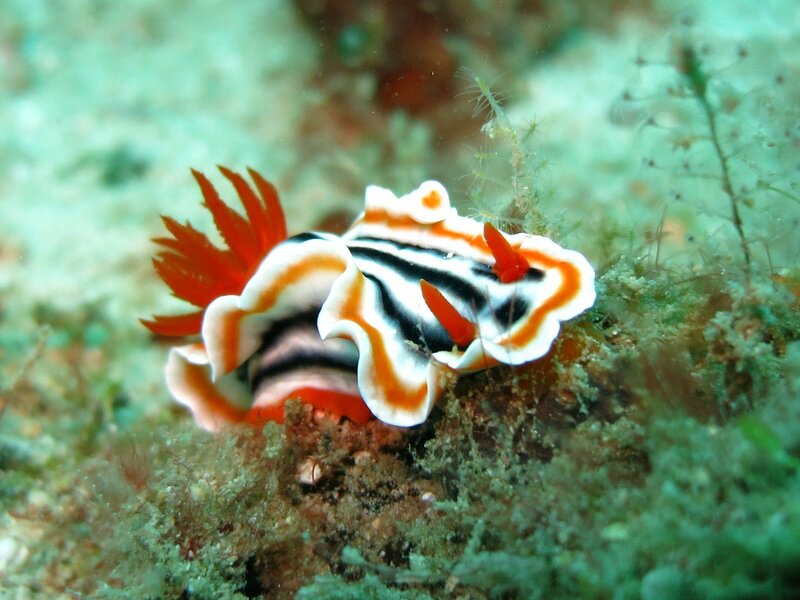 There are some incredible natural attractions and animal species in the Philippines. From nature conservatories to coral reefs, volcanoes to caves, the Philippines is FULL of amazing attractions. There are incredible things to see on almost every island. 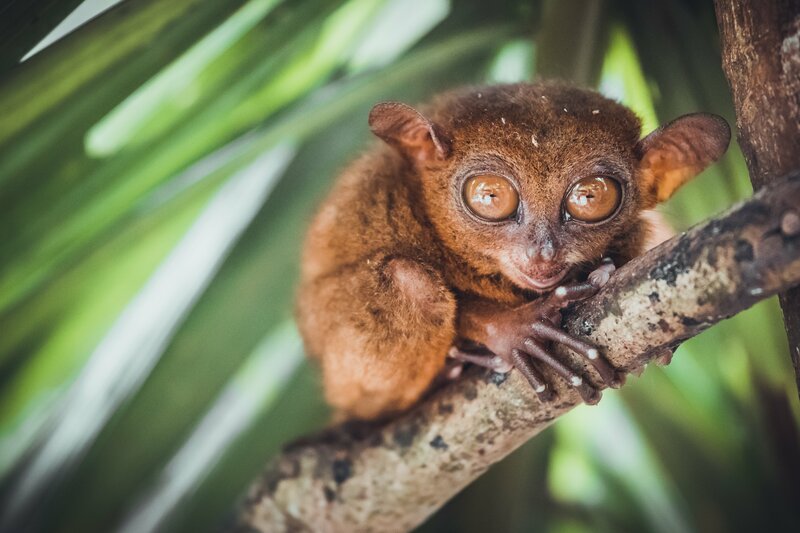 On top of that, it’s home to some incredible species of wildlife, like the whale sharks and the Tarsier monkeys. With that said, it’s important to support organizations that are taking good care of these animals and places. Unfortunately, with the rise in tourism, poor environmental practices are going on, like feeding the whale sharks, capturing wildlife like pythons and alligators for tourists to take photos with, etc. These kinds of practices are not okay, and you should do plenty of research on them before you choose to participate. 7. Trash disposal is a huge problem around the Philippines. The Philippines is ultra beautiful, but unfortunately, trash is a huge problem here. You’ll often see it sitting on the side of the roads, washed up on beaches, and burning in people’s yards. Yuck! The one surefire way to ensure you are being a responsible traveler is by minimizing your trash consumption. Refuse plastic bags when offered and opt for fresh fruits/veggies/bread instead of pre-packaged stuff. Bring your own lightweight containers for to-go food and use a water bottle for all drinking water. The less you contribute to the trash problems, the better off everyone will be. Some governments, like the one in El Nido, are responding to the massive amounts of trash. Recently, El Nido’s local government banned all plastics aboard the tourist boats (though they are still allowed in the town). Boracay has also put in place strict environmental regulations since it reopened in late 2018. Hopefully, in the future, more and more local governments will begin to follow suit. 8. It’s helpful to remind your tour operators of the importance of sustainability. If you see your hotel or tour operator using disposable silverware and plates, or giving out plastic water bottles, it’s helpful to provide some feedback about reducing single-use waste. These business owners often do listen to customer complaints and feedback, so give them the opportunity to respond and improve. Even simply speaking to the guide or owner in private at the end of your tour, or sending them an email, can help to improve sustainable travel practices in the long run. 9. The Philippines is safe for tourists. You may have the idea that the Philippines is unsafe for tourists. And while there are some unfortunate things going on in the country currently, tourists aren’t the targets. It’s a perfectly safe (and stunning) place to travel, and most of the tourist spots are far away from any violence. With that said, you should always stay alert and aware of your surroundings, and be on the defensive of yourself and your belongings at all times. Despite this, I’d still recommend doing two things to protect yourself: buying travel insurance and bringing a handy money belt to store your valuables. Travel insurance is critical on any international trip, be it the Philippines or Canada. I’ve used World Nomads travel insurance for all of my international trips since 2015 and, after I almost died while traveling solo in Thailand, I would HIGHLY recommend them. Not only will they protect you against theft, but they’ll also cover costs for medical emergencies, flight delays, and more. 10. Aim to support local businesses rather than foreign-owned companies. Many Filipino families, especially in small towns, run their own businesses, restaurants, etc. However, these smaller businesses often have to compete with large, multinational investors who set up shop in tourist areas. The easiest way to support locals is by spending money in their establishments. This is easy when it comes to food. The best Filipino food in the country is cooked at home, so it’s only natural that locally-owned businesses would have the best and most delicious eats. And of course, it can be hard to avoid foreign-owned businesses (especially hotels) all the time, but be sure to do plenty of research and try your best to stay in locally-owned accommodations. That way, your money is going right back into the communities that you are visiting. 11. You’ll need SMALL BILLS as a tourist. One minor byproduct of frequenting local businesses is that they often don’t have a lot of change. Therefore, that 500 or 1,000 PHP bill you just got from the ATM is basically useless in small towns or locally-owned shops, especially if you’re spending 100 PHP or less on something. Be sure to break those big bills at airports, department stores, or hotels, and carry lots of small bills for day-to-day expenses. Luckily, you can also use these small bills for tips, too. 12. Tips often aren’t mandatory, but they are often helpful for supporting locals. How can I say this nicely? The minimum wage in the Philippines is pretty low. In most places, it’s less than $10 USD per day. Tack that onto feeding a family and it becomes really, really difficult. Tipping isn’t really standardized in the Philippines, so you may have an included tip charge on your restaurant bill, or you may not. Taxis and guides usually do not have tips included. If someone gives you great service, be it a tour guide, or a waitress, or a masseur, or a driver, don’t be afraid to tip 10% or more. These tips go a long way for locals and they are greatly appreciated. 13. You can get from island to island by boat or airplane. This one should be pretty self-explanatory, but there are only two ways to get from island to island: by boat or by plane. Boats usually take a lot longer, are more bumpy (as the seas can get somewhat rough), and often are cancelled when the weather isn’t perfect. Planes, on the other hand, are slightly more expensive but are more reliable. Either way, the weather in the Philippines can often be unpredictable, so it’s wise to budget in a few extra days for getting from place to place there (in case of delays or cancellations). 14. Bug spray and reef-safe sunscreen are critical, but try to bring them from home. The Philippines is a tropical country, which means there are mosquitoes. Lots of them. And with the onslaught of mosquitoes comes a risk of mosquito-borne diseases like Dengue or Chikungunya. The best way to protect yourself from mosquitoes is to ALWAYS wear a layer of bug repellent. I use this kind of repellent because it’s soft and non-greasy on my skin. Similarly, sunscreen is an important thing to consider. Since you’ll likely be swimming very close to coral reefs and marine wildlife, it’s important to do what you can to protect them. By wearing ONLY reef-safe sunscreen like this, you can help protect (and avoid poisoning) the beautiful coral reefs while traveling in the Philippines. 15. Water shoes are a must. Like I mentioned before, you’ll be doing a lot of swimming in rocky areas or coral reefs. This means that you can easily get cuts on your feet and toes from the sharp edges. You can protect yourself AND the corals by wearing closed-toed water shoes whenever you get in the water. Here’s a pair we recommend for women and men. 16. Public transportation is a bit difficult to get a grasp on. As you’re riding through the Philippines, you might see large, colorful vans or buses that seem to be carrying WAY more people than they actually fit. These, my friends, are the local jeepneys, and they are a very interesting aspect of local life. Basically, they work like any other bus system, where each has a particular route that culminates in a final destination. However, they’re largely run by private owners, so figuring out which jeepney goes where can be ridiculously difficult sometimes. The good news? It’s ridiculously cheap, usually about 10 PHP or so per ride. If you’re wanting to use public transportation, be sure to know the name of the place you’re going so you can ask people which jeepney to use. Or, when in doubt, just take a taxi. 17. You can speak English to locals! There are 172 languages spoken in the Philippines, with the most popular being Tagalog, Visayan (Cebuano), and English. However, English is a part of compulsory education in the Philippines, and most people still retain a basic level of the language throughout their lives. While the accents can sometimes be strong, you can definitely speak to locals in English, and they’ll almost always be able to respond. However, it’s always courteous and greatly appreciated to learn a few words in Tagalog (or even better, the local language), like “hello,” “thank you,” etc. 18. Filipino food is incredibly diverse. When I hear people saying, “I don’t like Filipino food,” it feels like a punch in the gut. I don’t know what Filipino food they’ve been eating, but most of the food I see in the Philippines is healthy, delicious, and usually fresh from the island where I’m staying. 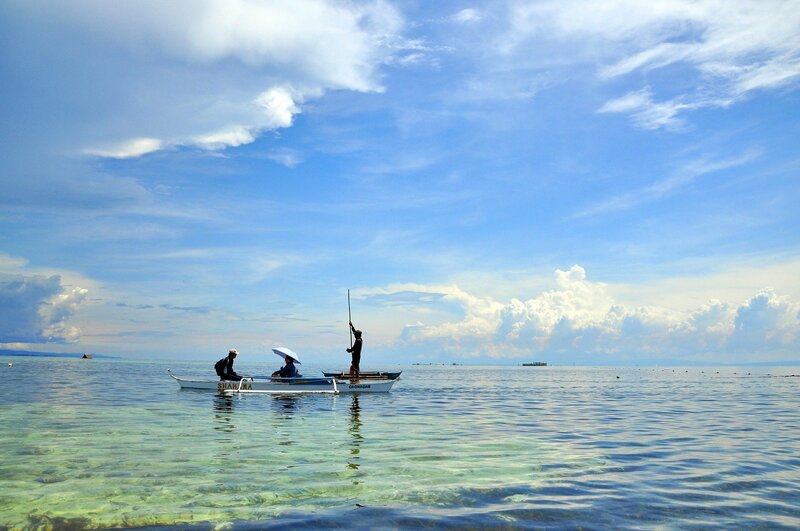 There are over 7,000 islands in the Philippines, each with their own local specialties and foods. There are fresh fruits, vegetables, seafood, tropical foods everywhere…how can you NOT find something you like?! But actually, I get where this sentiment comes from. I have the privilege of staying with relatives when I visit the Philippines, which means I get amazing, home cooked meals with local recipes every day. Most travelers don’t have that luxury, so they eat out at Filipino kiosks and restaurants, many of which serve the same few dishes: adobo, pancit, lechon/crispy pata, fried chicken, etc. 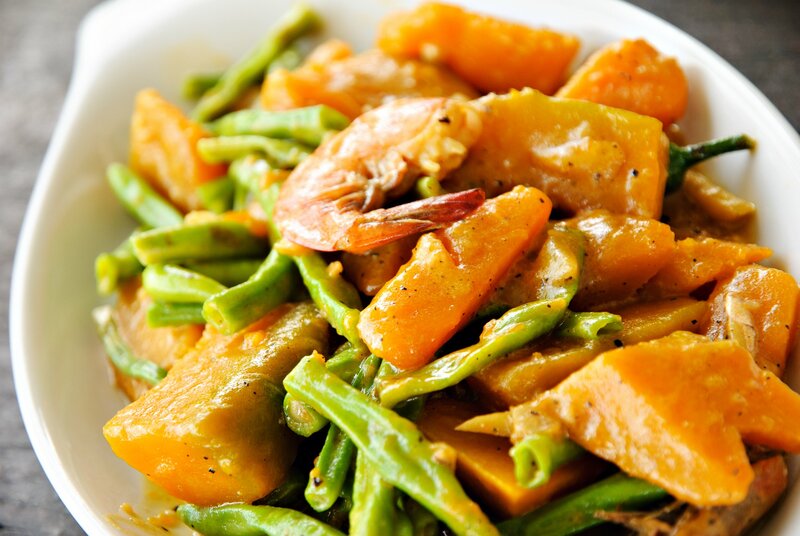 Therefore, some tourists get the impression that Filipino food isn’t that diverse. But if you’re a foodie visiting the Philippines, I challenge you to find food that you love. You can do it. Whether you search extra hard for a home cooked restaurant, or make a local friend who invites you over, or take a cooking class where you learn to make local specialties, I guarantee you’ll find Filipino food that you adore. You might just have to look for it. 19. Tap water quality varies from island to island. The tap water in the Philippines can vary greatly in terms of drinkability. In some places, it’s perfectly clean right out of the tap. In others, it is full of chemicals and sediments. Because you never know how clean the tap water will be, I recommend always drinking purified/filtered water or filtering it yourself using a water bottle and a purification system (I use a Hydro Flask bottle, a Sawyer filter, and a SteriPen). You can also boil water before drinking it. 20. The Philippines is home to some of the sweetest, freshest tropical fruits in the world. The list goes on forever. I think I find a new fruit that I love every time I go back to the Philippines, and you will too! 21. Filipinos often eat with their hands. You might find it strange, but Filipinos often eat with their hands. It’s a totally normal way of life there. In fact, there’s a traditional feast called a Boodle where all of the food is served on banana leaves and eaten with your hands! You’ll likely need to eat with your hands throughout your trip, so be sure to wash your hands often or come armed with hand sanitizer or wipes for pre-meal cleansing. Pasalubong is a noun, that basically means “a gift for a loved one.” Whenever I visit the Philippines, my mom sends me with a giant suitcase full of gifts for every family member. It’s common family or friend etiquette to bring back small trinkets, gifts, or supplies when you return to the Philippines. During the holidays, each item comes wrapped nicely. As a tourist, you should be aware of this too, especially if you’re going to be staying with friends or local families. It will be greatly appreciated if you bring some kind of pasalubong to your hosts, whether it’s a snack from your home city or a small trinket or souvenir. 23. Elders command a lot of respect in Filipino tradition. You might see young people taking the hands of their elders to their foreheads, or calling older family members “Ate” or “Kuya.” These gestures are a sign of respect for elders in the Philippines. While you don’t have to do any of this as a tourist, it’s important to keep in mind this deep respect for elders as you interact with locals. 24. Filipinos have a lot of legends and superstitions. One of the most fascinating elements of Filipino society, in my opinion, is just how many legends and superstitions are passed down through communities and families everywhere. In our ancestral home, my family sits around and discusses old family history and legends for hours over cookies and calamansi juice. Most other families are like this in some way or another. And then, there are the islands. Each island has its own superstitions. I grew up hearing about the aswang and other scary stories about children who behave badly… But each legend goes to show that Filipinos are deeply connected with nature and with their heritage. If you want to learn more about legends in the Philippines, just ask a local (especially in the more rural areas)! One thing you ABSOLUTELY have to do while traveling in the Philippines is karaoke. It’s a Filipino national pastime, drinking San Miguel beer and singing at the top of your lungs with friends. If you befriend a local, ask them where the best karaoke place is (there’s usually one or more on every island). Let loose and enjoy! Some Filipino karaoke favorites include Top 100 songs from 3 months ago, Celine Dion, and musical tracks. When I brought my boyfriend to the Philippines for the first time, I told him to listen out for the common Filipino salutation, the famed “sir/ma’am.” Once you hear it, you can’t unhear it. I’ve never heard this anywhere else in the world, EXCEPT from Filipinos, but I think it’s a lovely way to address people when there’s a mixture of genders present. When you visit the Philippines, listen out for this (sometimes funny) greeting, and smile to yourself when you finally hear it. 27. Filipinos are some of the kindest, most generous people in the world. You may have heard this from others or witnessed it first-hand, but Filipinos are seriously kind and generous. Even though I go back to visit family and not purely for tourism, I love how welcome I feel whenever I return. Filipinos love it when people come to experience and visit their beautiful home, and they’re quick to provide any help or recommendations that you might need. So, the tl;dr? If you decide to visit the Philippines, you might just come back with a new set of friends and family that make this island nation feel like home.